[Updated with video] After several years of research and planning, the “Cahow Cam Project” is ready to take flight. Today at an Earth Day news conference, Ascendant Group Limited, the Ministry of Environment & Planning, LookBermuda/LookFilms and North Rock Communications Ltd., announced that the long-planned project is online and available for all to get a close look inside the nests on Nonsuch Island Nature Reserve. This is the latest development in the Ascendant Nonsuch Island Project, which is a 10-year, $500,000 partnership between Ascendant Group and the Department of Conservation Services to continue to preserve and improve Nonsuch Island. 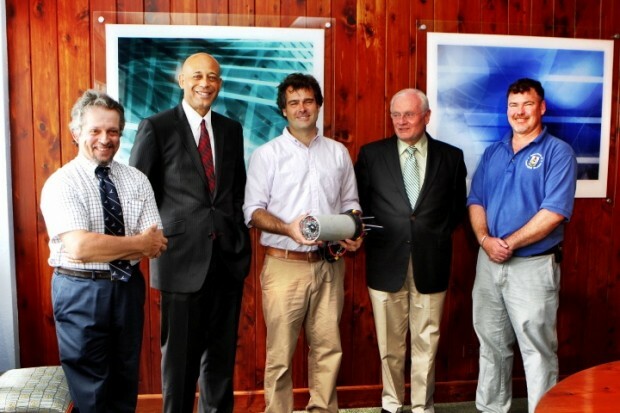 For 2013, in addition to other smaller projects, Ascendant Group is funding LookBermuda’s installation of their proprietary custom built “Cahow Cams” that are supported by networking from North Rock. Walter M. Higgins, Ascendant Group President & Chief Executive Officer, said, “We are delighted to support this innovative project, which gives people the opportunity to see Bermuda’s national bird in a wonderful new way. For the first time, we are able to look through a window, provided by LookBermuda’s miniature cameras, to see nesting Cahows in their burrows in real time. The internationally renowned “Living Musuem” on Nonsuch Island encapsulates much of Bermuda’s original natural beauty, while its isolation helps protect many of the rare species that make Bermuda unique. Nonsuch Island continues to be an inspiring conservation success story that is an envy of many other countries. Nevertheless, the health of this natural refuge is fragile. While introducing Nonsuch Island to as many people as possible, specifically young people, is an objective, there is a very real risk that the experiment could be destroyed due to its limited carrying capacity and inadvertent introduction of invasive species. The Cahow Cam project was conceived as a means of bringing the best of Nonsuch Island to the general public via the Internet. Cahow Cams overcome the difficulty of getting the public to Nonsuch Island and support conservation efforts to limit the number of people who visit the nature reserve. LookBermuda’s Jean-Pierre Rouja developed the Cahow Cam project in consultation with Jeremy Madeiros and the department of Conservation Services, as a follow up to their successful film on the Cahow Translocation Project, which was released in March 2011. 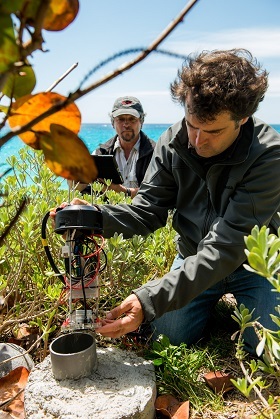 For the Cahow Cam project, LookBermuda has leveraged all of the latest technologies to produce and stream live HD footage of the nests and lives of the rare Cahow or Bermuda Petrel. For the next several months, footage will be recorded and posted to the site. Later in 2013, a new installation of solar panels on Nonsuch Island, funded and installed by Ascendant Group, will power the cameras 24 hours a day, along with the required networking equipment so that live footage can be streamed via North Rock Communications. This same footage will also be able to seen on a new display which will be mounted at the Bermuda Aquarium, Museum and Zoo. To accomplish this, LookBermuda | :LookFilms use miniature , high-definition (HD) video cameras, that they customized to be (IR) infrared-sensitive and paired them with their custom built military-grade invisible infrared lights. North Rock is providing the latest wireless technologies to stream live video from the islands to the Web, when the solar power installation is complete. 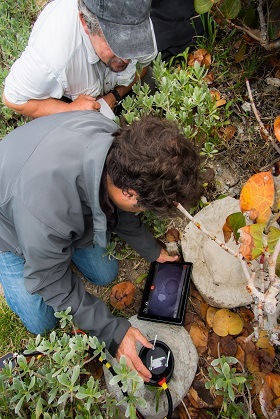 Additionally, the Cahow Cams will enable the Department of Conservation Services to inspect the nests using WiFi-connected iPads that control the cameras in the burrows without disturbing the birds. The miniature cameras will also be used to observe nesting Longtails or White-tailed Tropic Birds (Phaethon lepturus), and have application for conservation projects worldwide. The lessons learned and technological developments will be made available to scientists in other jurisdictions by LookBermuda. The Ascendant Nonsuch Island Project partnership, which started in 2010, has produced numerous improvements for the island. Ascendant has funded the purchase of a new Boston Whaler for use by Conservation Services, new signage, utilities and development of a mini-museum display. The company’s employees have contributed hours of work as volunteers, assisting with projects that range from clearing invasive plant species to painting, moving in new windows and readying the property for installation of a new solar power system. Agreed! Wingate, Madeiros & others have done a wonderful job of saving this type of petrel from extinction. The people of Bermuda should be proud of this & bring as much awareness about it as they can to others. It would be nice & more fitting to see this bird on our quarters instead of the longtail. Hopefully there will come a time when this bird becomes abundant again to the point they can be easily spotted flying around the island.